League members: around 190 teams from all around Europe participate in the League every year, with 56 playing in the competition proper. The UEFA Cup was formed in 1971, and changed its name to the Europa UEFA League in the 2009-10 season after it underwent a format change. The UEFA Cup had replaced the Inter-Cities Fairs Cup, the European football competition played from 1955 to 1971, after the number of clubs competing grew significantly and the importance of the competition grew. Tottenham Hotspur was the first team to win the UEFA Cup in the 1971-72 season. In 1999, the UEFA Cup competition was merged with the UEFA Cup Winners Cup, which used to be the second-tier European competition. In 2009-10, the rebranding of the UEFA Cup as the UEFA Europa League included a merging with the UEFA Intertoto Cup: this meant an expanded group stage and a change in qualification criteria. So far, 27 clubs have won the title, with 12 of them winning it more than once. The club with most victories in the competition is Sevilla – it won the League 4 times (in 2006, 2007, 2014 and 2015). Other successful teams have been Juventus, with 3 victories (most recently in 1993), Internazionale with 3 victories (most recently in 1998) and Liverpool with 3 victories (most recently in 2001). The player who scored the most goals in the League to date is Henrik Larsson, of Feyenoord, Celtic and Helsingbord, who had scored 40 goals from 1996 to 2010, when he retired. Other top scorers of the League are Radamel Falcao (of Porto and Atletico Madrid) with 30 goals since 2010, and Klaas-Jan Huntelaar (of Heerenveen, Ajax and Schalke 04) with 30 goals since 2004. Radamel Falcao's 2 goals again Athletic Bilbao – In the 2011-12 final game between Atletico Madrid and Athletic Bilbao, Radamel Falcao made two amazing strikes, leading Atletico Madrid to victory. 2 UEFA Super Cup Victories for Atletico Madrid – Europa League winner Atletico Madrid managed victories against Champions League winners in two occasions: in 2010 it beat Inter Milan, and in 2012 it beat Chelsea, in the UEFA Super Cup. Fulham reaches 2009-10 final – in an unexpected turn of events, Fulham reached the final stage of the Europa League's first season, 2009-10. While it lost the title to Atletico Madrid, its race to the final made a lasting impression. Go to the "Leagues" category on the homepage, and choose "Europe UEFA League" from the list, or else search for "Europa UEFA League" in the search field until you reach the league's events' menu. 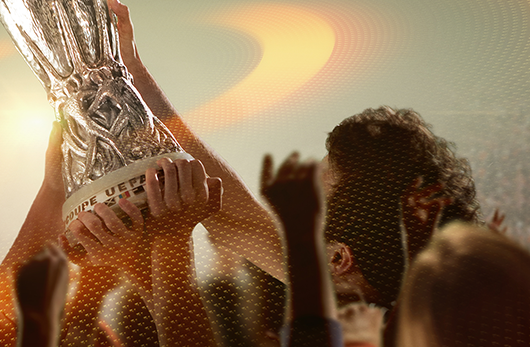 Click on "Continue" to confirm your Europa League Tickets purchase.